With “Red, Not Blood,” I wanted to use the medium of videographic criticism to create an exploratory, elegiac piece of criticism combining moving images, music, and still photographs based around the myths of Frankenstein and of cinema. 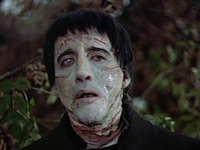 I began with my interest in the rarely seriously scrutinized horror films of Britain’s Hammer Studios, which are excluded not only from discussions of the larger body of Frankenstein films (James Whale’s Universal films are usually the main objects of study), but from the body of horror films in general. This, I suspect, may have to do with the Hammer horrors’ status as B-movie (admittedly static ones) and their general lack of artistic and narrative ingenuity. However, what I found lacking in the plots was compensated by the eccentric color palettes: a gloomy series of greys, broken every so often by explosions of Renaissance greens and – most dramatically – ghastly blood-reds. I wanted to explore the affect of these reds – while, at the same time, paying attention to their muted, caged-in feel, the sense that these are not reds blaring at full blast, but reds itching with a manic potential energy waiting to burst into full reds. Simultaneously, I became hyperaware of my separation from the color stock of the Hammer horrors – a result of my watching them on early-2000s DVDs, which were scanned from prints multiple generations removed from the original camera negative, which was shot on the color stock known as Eastmancolor (a cheaper and less visceral 1950s alternative to the much more expensive and expressive Technicolor). These degrees of separation both thrilled and saddened me, and I wanted to create something that would suitably express this manic depression, this inability to become, to flourish. I wanted to create something in an elegiac yet playful tone, something which aimed to connect disparate events into a narrative of loss of a particular way of, as I say in the video essay, “shaping life through the camera,” causing one to see something seemingly mundane (the color red) anew. I chose, as my thematic base, Jean-Luc Godard’s 1963 feature Le Mépris (“Contempt”), a film subtextually about the death of the classical Hollywood system. I try to bridge the gap between something cinematically “highbrow” like Godard’s film and cinematically “lowbrow” like the Hammer horrors (coupled with something truly cruddy like I Was a Teenage Frankenstein!) through the possibilities afforded me by Final Cut Pro, the software I used to cut the video. I also brought in quotes from the original Mary Shelley novel, as well as the eerie portraits by the American Southern Gothic photographer Ralph Eugene Meatyard from his “Lucybelle Crater” series in the late 1960s and early 1970s, which show extraordinary empathy and ease with the debauched. I hoped not to advance a particular argument, but instead looked at my materials and made intuitive edits and connections via montage as I went along. I wanted to forge unintuitive connections across media and oceans, with the ultimate connecting glue being a celebration of the material/physical, a sadness at its cheapening as the years roll along, and a sympathy for the monstrous. At the same time, I hope my video essay can be used as a model for the poetic potentials of videographic criticism, a relatively nascent form of analysis and creation which excites me as much as the thought of watching The Red Shoes in Technicolor nitrate. Hearn, Marcus. The Hammer Story: The Authorized History of Hammer Films. London: Titan Books, 2007. McElhaney, Joe. The Death of Classical Cinema: Hitchcock, Lang, Minnelli. Albany: SUNY Press, 2006. Nemerov, Alexander. Ralph Eugene Meatyard: American Mystic. San Francisco: Fraenkel Gallery, 2017. Rombes, Nicholas. Cinema in the Digital Age. 2nd edition. New York: Columbia University Press, 2017. Carlos Valladares (b. 1996) is a freelance critic, scholar, curator, video essayist, and writer. In June 2018, he graduated Phi Beta Kappa and with university distinction from Stanford University, with a dual bachelor’s degree in Film & Media Studies and American Studies. He was a recipient of the 2018 Dean’s Award for Academic Achievement, given to only a select few Stanford undergraduate students. In 2017, he curated and wrote the wall texts for an exhibition, “Abstraction and the Movies,” at the Anderson Collection, which paired movies with works of American modernist art from the Anderson’s permanent collection by Jackson Pollock, Helen Frankenthaler, and others; KQED Arts listed it as a must-see Bay Area event. His video essays have shown at the Pesaro Film Festival, Sydney, Prague, Washington D.C., and San Francisco. He has written for The San Francisco Chronicle, Film Comment, and The Stanford Daily. He has worked as a research assistant on two upcoming books on Joseph Cornell and The American History of Black and White Race Relations in Film (Routledge, 2019). He was born and raised in South Central Los Angeles; he currently lives in New York City.